Porcelain has a fine high ring to it, fired as it is to 1260 degrees Celcius. 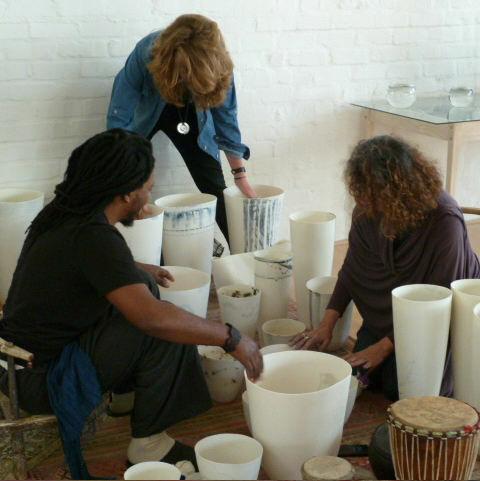 At this temperature the clay particles vitrify producing the potential for bell like sounds which are similar to the sounds made by metal singing bowls, gongs and bells used in many cultures and in many spiritual traditions from all over the world. The best sort of sound engagements that I have on my own are solitary and not to do with making music but rather to do with thinking and feeling. The best sort of thinking might be thought of as praying and happen with the heart and the mind engaged together. Words and language are left out. These engagements have been exploratory and contemplative and probably (in traditional terms) not musical at all. 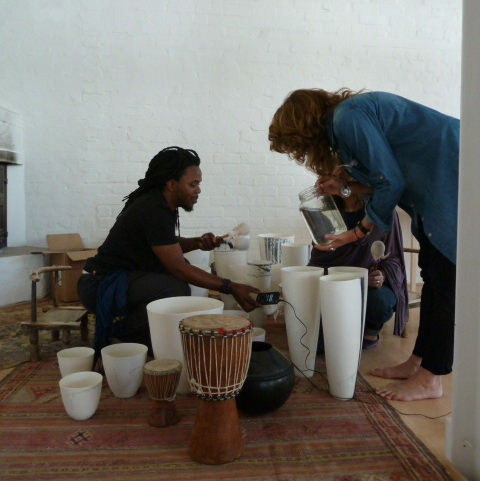 In instances where I have been part of communal explorations of the sounding vessel’s and their capacity for sound in relationship, the vessels are selected and arranged for their tones. The play between the players takes time but finally falls into ensuing rhythms and become explorations of human and clay vessels together. The harmonics of relatedness come to mind, and also there is the question of listening and hearing keenly.